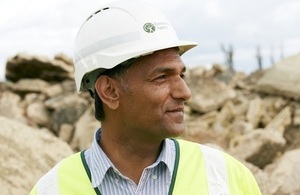 An Environment Agency Officer at a waste site. Environment Agency enforcement officers, on the 14 February, paid unannounced visits to 14 sites across Oxfordshire, Buckinghamshire, Surrey, Hampshire and West Berkshire in a bid to stamp out waste crime and protect the environment from the threat of pollution. Named Operation Arrow, officers targeted sites suspected of operating in the waste business without the required environmental permits, flouting the law and committing crime. Waste that ends up at unregulated sites is often stockpiled in vast quantities and for long periods of time. The waste can pose a significant risks to the environment, blighting communities with smoke fumes and causing noise and odour complaints. Illegal waste operators also undermine the work of legitimate waste companies, creating an unfair playing field for business. We want to make sure the right waste goes to the right place - to protect the environment and local communities. Site visits on our days of action are just one of the ways we are tackling waste crime to help make sure this happens. We are really pleased with what we achieved. Of the 14 sites visited, 5 were found to be operating illegally. The information we have gathered is helping us target our work at those involved in organised environmental crime and where their activities pose the greatest risk to the environment. Everyone can do their bit to reduce waste crime by making sure that any waste for disposal is collected by a licensed waste carrier and taken to a properly permitted, legitimate waste site. To check if someone is registered please visit environment.data.gov.uk/public-register/view/search-waste-carriers-brokers.